Fits perfectly in bins with liner pockets and dispenses liners one at a time — no perforations or unravelling — from inside the bin for a faster liner change. Excellent product; always a perfect fit; prompt delivery service and good value for money. Bin Liners do what they're supposed to. Does exactly what it says on the tin (or in this case, the packet). Forget leaks and spills. These bin bags are robust yet good looking in my white simplehuman bin. Worth the extra. Definitely! I love the liners. For me they are a perfect fit for a weekly load. I absolutely love using my Simple Human bins and bags. I have one for general rubbish and another for recycling. They look absolutely stunning together and because of the wide openings are easy for any size of refuse and it's great to be hands free too. With the facility of spare bags sitting within the unit, they are there at hand which is an added bonus. I couldn't be happier and everyone who sees them admires them and wants to know where they can buy the same. Strong, no leakages, lasts for ages (I’m a single person though). The original ones you get with bin felt slightly thicker than these refills, but no difference in end result. They fit like a glove. Received my reorder within a few days. However, the pull strings on the bags are pretty flimsy and will snap apart without much force. Would still recommend, since you will be hard pressed to find replacements that will fit. My quality of life has increased dramatically upon discovering simplehuman. These bags and their pull-out trash can turn the worst part of the kitchen into an orderly and efficient repository for waste. They have elevated the art of dealing with trash exponentially. Great product. Quality design. The best bag and can on the market! I love my new trash bags! They are so big and durable! I can get so much more trash into these bags which is a savings because I use less bags. They do not easily puncture like my other cheap ones! They are well worth their price! I love these bags they sit inside my garbage can witch is great also so easy to refill and these bags fit perfectly and strong all I can say is I will be buying simple human from now on. I ordered these bags so the fit would be perfect. I love the fact that these are made especially for the trash cans. Who knew? I didn't really know I even cared about trash bags. We are at week three with these custom fitted bags and I AM IMPRESSED! I am planning to get three more boxes or so for a couple year supply. Totally RADICAL! Thanks Super-Simple-Humans! No more split bags when emptying the bin, they fit perfectly and the fact they are easily dispensed from the packaging box makes even more space in the cupboard under the sink.! Can't believe how simple but effective these bin liners are and how much easier they have made dealing with the disposal of rubbish which is a yukkie household job. Won't be going back to supermarket bin liners ever again. Good bags, they fit perfectly, and they are fairly strong. But they are too expensive. I bought these without shopping around...shame on me. At $23 plus S&H for 60 bags, they run about 41 cents a bag. I found that at Jet, I could get 250 10-gallon bags (made from recycled plastic), of comparable OR GREATER strength, for $28...that's about 11 cents a bag. Similar products for similar prices from other sources. True, these bargain-basement bags don't have the pull-tight ribbons, but I don't mind attaching a tie-closure to save 75%. The 60 SimpleHuman bags will last me a long time...but when they're gone, I'll buy a cheaper brand. I bought two. Both are the same size and are well built. I found the bags pricy but they are custom fit. If you have access to the military exchange system, buying them there is a bit cheaper. If not, it's a battle between their web site and Amazons but you're talking cents. I've been using these liners of almost a year since I changed my trash can. I enjoy and appreciate these liners b/c their everything the old liners I used to use weren't. The prevent trash smells from escaping from the can, they are very thick so that trash items don't puncture the bag and fall out. They are custom made to the new Simplehuman trash can I now love and use. I will always use these liners, their the best! These bags hold a large amount without leaking. These three pack is a great option for keeping refills on hand. I love having the bag hidden in the trash can. These liners are great. They are very strong and easy to use. They hold more than the liners you buy in the the stores and are much stronger. I love these liners. I am spoiled for other can liners now. Best trash bags I've ever purchased with the best fit for the trash can ever. No slipping at all. Trash has always been an issue ... Too small, bags too flimsy, sliding don the can, but this is absolutely ideal! Will now try other items based on quality demonstrated. Great bags, which are a great fit. Keeps the bin clean and forms a good seal in bin preventing smells fom contents. This is my second time that I have ordered these, use them at my cabin. Have never had any problems with them; excellent product. a little costly, but worth it! Bought this nice garbage can for our new kitchen and of course when I ran out of the supplied with purchase lliners, I had to get more! The ones you purchase seem not as thick as the ones that came with the can, but they do fit perfectly, never slip off, haven't leaked or torn yet and you have the built in slot to hold the remainder of bags fr easy access! Very pleased with these liners! Thanks for your review! Our liners are made in the same thickness as the sample packs. If you have any difficulties with any of your simplehuman products, please contact us directly at 877-988-7770 Mon-Fri, 8-5PM PST and any one of agents will gladly assist you. These bags fit the bin perfectly and are very strong. Good product. The bin and the liners are the best that I have ever bought. The colour grey matches my new kitchen. I love the way I just press on the foot part and do not have to lift the lid. I am very impressed. Great bags, sturdy, priced nicely. Packaged professionally, and always mailed promptly. I have been using these garbage bags in my Simplehuman gargabe can for a few years now. I have not had one tear, nor one leak, nor any kind of problem or issue with them. They fit perfectly, obviously since they are made for it. I can't say that about any previous garbage bags I have used, including Glad ones. These cost a little more, but do what they are supposed to, with dependability, quality and no downside. Love em. Best bin and liners ever!!!! I love this trash can. My other one had been a wooden Amish one the kids bought me 30 years ago, I hated to part with it. I am so happy I did the butterfly trash can is awesome and I love the bags that goes with it. It was a great buy. Funny how simple things can make one happy. I am very happy with my new trash can and the liners that work with it. Have no complaints!!!! Love this product, great qualifty! Fits perfectly and great quality. Get them in bulk - the discount is worth it. And then you won't have to reorder for quite some time. Love these liners. Very strong. Do not tear or rip like other bags. Would definitely purchase again. Recommend! Good product, good quality, good service. Like these bags very much. They fit in the can great and are strong!!! In have many simplehuman step cans throughout my property. The liners from simplehuman are the best I have ever used. No leaks, fit well, look good, loved by the garbage pickup personnel. Had been using regular liners. They did ok but the liners by Simple Human were much easier to put in can & seemed to be a little thicker also. Will continue to order. I am very pleased with my purchase of these liners and my new trash can. Liners are so strong, I have not had one rip or leak. I would recommend this to anyone. Thanks for a great product. The bags are great, they are strong and they fit. Of two important things about plastic bags, the thickness and the shape, both are good. My annoyance was that the delivery process was painful. The delivery company, UPS, wasn't able to leave them outside the house when no-one was in because it required a signature. Re-delivery took more administration, waiting on hold to talk to UPS because their website wasn't up to the job. I've spent less time getting a piano delivered. It shouldn't be so difficult. After all, they are just a box of plastic bags. These bags are well packaged, fit the garbage can well, and are strong with no leaks. I'll definitely buy again. Custom fit can liners the BEST!! Perfect fitting, not visible at all and the strength is amazing!!! LOVE these bags!!! Have used about 120 + of these bin liners, they fit the bin perfectly. They have good strong tie/pulls, not a one has split or dripped any liquid out yes they cost more than others but they are leagues out in front for quality shame to throw them away really. While these are perfectly average bags, I really prefer our Glad bags because of the stretchy fit of the top of the bag. With these K liners, I don't feel that they hug the can as securely as the Glad bags. Bought these as we could not get bags that seemed to fit the bin well. These do the job perfectly and the method of storage and dispensing much more convenient. Fit is snug but not difficult to install or remove. No slipping. Ties work very well also. Fantastically strong and good quality. The bags fit perfectly and I love the dispensary pack. My only negative was the time of order through to actual delivery. Merci de vos commentaires positives. Quelqu'un de notre service client sera en contact avec vous en concernant les autres poubelles dans notre gamme de produits. Even though reviews are so important to give, I rarely do, but I make this exception to say this system creates a sustainable flow for trash management that is life changing. The best bin & bag solution I've ever used. The bags fit perfectly, with enough give at the top for all those things uounthrow in a the last minute. They seem pricey, but have saved me money because now I need only one bag per week. Previous, cheaper, bags were sealed when only three quarters full, because they would otherwise split. Much stronger than other liners, and fits the bin perfectly. Well worth the price, I wouldn't consider using anything else. I think its a crock that I bought a garbage can and didn't know I was going to need to buy special bags to put in them... if you want to sell great bags - awesome - market them. But I am stuck buying them unknowingly because I bought a kitchen garbage can that tears normal kitchen bags. One of the reasons that customers like to buy simplehuman liners is because our liner are strong. I really like the snug fit that your liners provide with the simple human trash can. In the past, I would have to try to tie the bag so that it would fit the trash can, often to come back and find that it had slipped down. This is a great liner and I am very pleased with the product. Highly recommended. I hope never have to go back to living without these trash liners. The plastic is strong and never tears. The drawstring tie works effortlessly and the bags fit exactly. Love the bags and container, bags slide out very easy. This is the best garbage can and liners I've ever bought.the liners are so strong and easy to use.so neat to take out no spill ,no leaks no ripes.just perfect. It's a great looking can and easy to use with something in your hands. Thanks for such an awesome product that makes the garbage process much more sanitary experience. Thanks simply human. the can liners fit the can like a glove, witch they should. They are of high quality and hold up very well when you pull it out of the can. With the larger size the bag can get very heavy. I have no fear that these liners will break. They make the whole package come together as a quality piece and a worth while addition to my home. Very strong bags that are easy to remove from the trash bin once its full. Excellent product....very pleased with quality and timely delivery of product. First things first I would like to say, if you have not tried this product then you have yet to truly taste life. This garbage bag was a godsend, a true gift from above. I mean, sure, it holds your garbage. Sure, it does it really well. This bag does more though... It tells a story of intrigue, of failure, of overcoming the odds, of a kitchen that doesn't smell like garbage. I don't know how I have ever lived without this garbage bag and I truly believe that anybody in their right mind should indulge in the beauty that is a life of code K, custom fit can liners. Because anything less is lying to yourself. I love these bags - they fit the can perfectly, I ordered the 3 pack and they are just great. A perfect fit means a perfect look. Great product, very convenient to have in storage so you don't have to worry about running out. I'm not sure how long these bags have been available but I wish I had them always. They are strong and fit the can well, as they should for a custom bag. Sure you'll pay a few more pennies for them but they are worth it. Just bought oblong bin. All other bin liners hopeless fit. These claimed to be custom fit and they are!!! There is hope for the human race after all. Alleluia says it all! I love all the products I've purchased from SH! And there are several of them. They work perfectly, as described. I purchase all my kitchen and bathroom products from them. These are an exact fit for the butterfly opening kitchen garbage can. Easily installed and easily removed. They cinch tie makes it easy to put out in the garbage. We like them very much. These are great! They fit perfectly and are also strong, and therefore do not break when lifted from the can. I recommend them highly. Great product that does not leak. Simple products are durable and you don't have to worry about leaking bags. I always place my orders with Simple Human for replacement disposal trash bag code K. Thank you. Somehow, I ordered the K size liner for my new can instead of the J size. This is my fault as I was confused on which to order and now know it's the J size. The K size fits well, though is a little larger than the J. I will reorder the correct size next time, but WILL reorder because I like the way these liners fit into the can. No problems with the liner slipping down, no tears when pulling it out (when it's heavy and full), and no leaks. Love that we can self-store new liners inside the can! I'm so satisfied with the trash can and liners that I'm pleased to have the brand name on the bags to promote this product when people see it. I'll definitely continue to order the liners. Like the box the trash liner come in - very convenient for storage and use under a small sink area. Great! Very happy with the fit- works perfect for my new hair salon. I bought the liners and they are great. They are very High quality and fit the trash container perfectly. I get twice as much garbage in a bag as I did with my old waste basket. They hid the garbage well. I wish I had splurged sooner. I use the recycling bags weekly to fill with all of our recycled materials. They are fabulous. The on street pick-up by the Streets Department always works smoothly because the bags are distinctive and strong so there is no leakage. A great product I have used for several years! Liners are nice and thick. Very strong! These liners work great with the simple human butterfly can. I was suprised to order a 200 bulk pack and get 4 ea. 50 bag packs. The liners fit perfectly so they are not visible with the lid down. The liners are strong, the drawstrings work efficiently and ensure nothing spills out. This shouldn't be remarkable but we've bought a number of (expensive) bins that were not up to a simple job. The Simple Human bin and liners do this simple job extremely well, and I'd recommend them without reservation. I bought in bulk, and saved a good amount of money. I have been using Simplehuman Butterfly trashcans for over ten years; they are simply the best. One of the great things about Simplehuman trashcans of all designs is their uniquely shaped lines to fit perfectly the can for which they were intended. Great as they are, they can be a little pricey when purchased on an as needed basis. When I moved to a new home in 2006 and bought the 45 liter butterfly can I decided to play it smart and buy the liners in bulk. Folks, this is the way to go. I've just had to reorder for the first time since 2006. While $98 may seem like a lot for liners, they are the perfect liner, you get 400 of them, and it's great to know that you won't have to think about it for several years. Highly recommended! These can liners are a must buy! STRONG, fits garbage can perfectly, sturdy handles. Easy to open, easy to install in garbage can, strong handles allow you to pull full bag of heavy trash out without the handles breaking. Blue bag for Blue recycling bin! I have two K-size containers in my kitchen - one for garbage and one for recycling. The blue bag makes it easy to tell people which is which. I use two to three bags per week and love the fact that it holds whatever I want to put in it! I will continue to use this product! An added bonus - my kitchen is BLUE! This is a nice, sturdy liner that fits well in my garbage can. The price is right, and I highly recommend the product. I like the liners from simplehuman because they fit just right, are strong and don't rip, and have a string to tie them up. Also, they are just a bit bigger, so that when you fill up a bag with trash, when you pull it up from the trash can, there's enough space to tie the strings to completely close off the bag. perfect liners for the slim trash can. love them. sturdy. does the job. will buy again. These bags are very durable and since I use them for recycling, they can be used more than once. These are a little expensive, but not if you want a bag that doesn't break open -- they are tough and they fit the can perfectly. Drawstring construction is very handy. Good strong bags can get loads in and no splits. Bags are excellent and fit for purpose - they fit butterfly opening bin perfectly. It is what is required for the container. it's capacious and simple to use, strong and easy to remove. We use the K-bags in our CW1361 trash can in the kitchen. They easy to install, tie closed and withdraw for disposal. In the past year it seemed that most trash bag manufacturers started making their 13 gallon bags just a little bit smaller which made them nearly impossible to stretch around the rim of my narrow step can. I stumbled apon the Simple Human bags while surfing the Amazon site trying to find a suitable bag, I looked up the model of my can and ordered the "K" bags which were delivered in about 7 days. The bag fits perfectly around the rim of the can and it has a little bit of extra legnth so that if you overstuff the can you can pull up on the tie strips and there is plenty of bag to close it tight. The perfect trash bag may not seem important to some but for my wife and I it has given us a whole new reason to live(well it's easier to take out the trash anyway). This trash can is perfect size. I had thought it would be somewhat smaller. Installs easily and work flawlessly so far. Trash can liners can make or break a trash can. If they fit, which these do exactly, then there is no accidental mess from ill-fitting liners. Thick, sturdy and easy to put into the trash can (Butterfly step can) for which they are designed. These liners are made for the type of bin we've got and do what they are designed to do. They fit snugly and can be folded tightly over the rim. They are strong and therefore do not leak and they can be tied firmly with the strings provided. Add to this their large size and all-in-all we are very satisfied with them. bags are strong and convient for us. they fit the buttertfly trash can perfectly. price is not too bad, but shipping and handling could be less. Sturdy. Will not tear. Ideally fits the basket. A bit expensive compared to other similar bags on the market. But the quality is much better. Best trash can liners ever! These trash can liners are simply the best! Perfectly sized for our Simplehuman kitchen trash can and durably constructed! Highly recommend! This liner is the perfect fit for my trash can. It never leaks and never tears. I've never seen any better liners. And the price is right. I bought the right size liners for my butterfly bin and always use them. They are very strong, never tear and they lift out easily without sticking. I also bulk buy them as I don't want to run out! We use this trash can every day and the K size trash can bags are perfect for it. These liners fit the trashcan perfectly. They do not slide down and they are sturdy. Defintely recommend versus trying to buy a cheaper model that doesn't fit. It fits the bin exactly. Easy to remove and secure for removal. Excellent durable quality. Looks neat and so easy to remove and replace that it make rubbish removal stress-free. Finally Got the Right Liner! Code K! Code K! If you've ever ordered the wrong liner you'll know what this review is all about. I had ordered it from another online company and got the wrong thing. I'm glad simplehuman was nice enough to help me get the right ones! I'll continue to order them from here from now on. Thanks for the great customer service and fantastic products (liners and can!!). I love bags that don't break and trash cans that look nice and are durable! Thanks again! 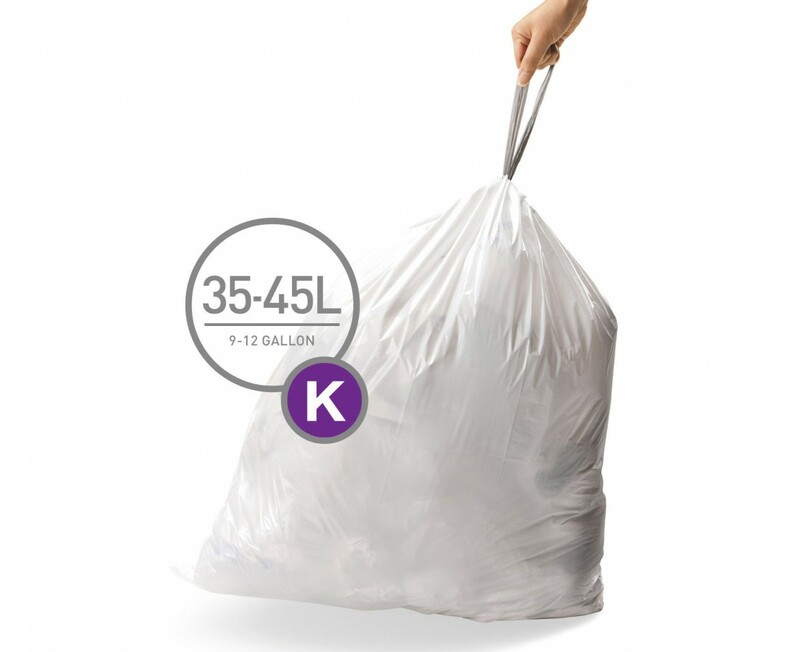 The K trash bags designed for the trash can is too big. The bags promise to be hidden when the trash can is closed however you can see the liner when the lid is closed. We’re sorry to hear about your problem. We stand behind our products 100%. A Customer Service Representative will contact you shortly to assist you with your problem. These bags are fantastic and have made putting out my recycling for pick up so much easier. My county only provides one small bin, and that's just never enough. These bags make it so much easier to collect and place out for pick-up, and because it's so much easier and cleaner to do so now, we're recycling even more. These bags are very strong and we've never had a problem with ripping or tearing. I like the sturdy, easy open and compact can size for its volume. The size means I only need to empy once a week for the two of us. I bought these bags to fit into the simplehuman trashcan that fits in a lower drawer and slides out on a track. It's GREAT!!!! My trash is hidden and it's a simply way to access it and push the trash back out of the way, and close the door. I LOVE IT!!! And the bags fit snuggly. We use the liners every day and they are well made of high quality materials and fit perfectly into the simplehuman trash can. I have been completely happy with this product. It looks good and works perfectly. I like the trash bags a lot, but you sent me the wrong size (H) and I ordered (K). (H) does not fit my trash can. We’re sorry to hear about your problem. A Customer Service Representative will contact you shortly to assist you with your problem. This is the best trash liner I have ever used. It is strong and the perfect size. I have been using this product for 5 years and I will use it forever. Best Little trash bag in Maryland! Best Little Trash bag in Maryland. Well made! I love the Simple Human products. I've owned the 38L butterfly closure trash can for many years. I really like that I can order the liners from your site in bulk; cuts down on trips to BB&Y to purchase. Your customer service is also great. About a year ago, you sent everything needed to repair the trash can, and it works as good as new. You stood behind your product and guarantee, and I'm impressed. I will continue to use your products and your site for purchases. Go Simple Human! Perfect fit - easy to use and close - recyclable! Need I say more? These bags are durable; have never experienced a rip or tear in the bag or a broken drawstring. By far the best trashcan liners I have ever purchased. We purchased the box of replacement bags; good value. Liners are a perfect fit;strong;hold a bunch and are available at a good price,when buying bulk. Strong and easy to use bags. I use them every day. Size is great and never rips. tie handles are strong. Provided you pick the right bag for the size of bin you have, they are great. I sometimes use odd plastic bags for lining trash containers, but these liners fit so well and are so easy to use, that I am sold on these liners. These fit our stainless butterfly trash can perfectly. They are strong bags and don't leave any gaps for food to get in to. I'm giving it 4 stars because they are quite a bit more expensive than regular trash bags. I will still buy them, though. THESE LINERS ARE THE BEST. THEY FIT MY SIMPLE HUMAN CAN PERFECTLY. NEVER HAVE I HAD ONE OF THESE LINERS LEAK OR TEAR... NEVER, AND I HAVE GONE THROUGH OVER 500 OF THEM. GO FOR THE BULK PACK AND GET THE 20% OFF. We've been using the Simple Human liners for over 5 years now and have not had a single problem with them. They fit the can well, are easy to install and remove, and hold up very well. We briefly tried cheaper (not much cheaper) bags and found that, perhaps very much by design, the Simplehuman bag is the only one of its size that properly fits our Simplehuman garbage can. That said, it's a good bag and we're happy that Sh offers the bags in quantities that mean we don't need to forage around our BBBY store for a few years. These bags are the only real choice for my recycling cans. Generic tall kitchen bags don't fit well, being more visible under the lid. However the K size bags are only available to me only on line. Simple Human Trash Cans are the BEST !!! Our daughter had a Simplehuman butterfly trash can. I commented on liking it. SO she gave us one for Christmas a few years ago. I continue to LOVE it. I purchase the Simplehuman trash bags online........once a year. Great to have them always handy. They work the best. These trash can liners fit very well with our simplehuman butteryfly trash can. We purchased a pack with our trash can and I don't want to use any other trash bags with my trash can. These are the BEST. They fit the Simplehuman recepticle very well. They are strong, heavy duty liners. When my very large supply runs out, I will definately purchase again. I have used a simple human trash can and liners for many years. They combination is sturdy and keeps the trash secure. The liners are strong and fit like a glove. Well made bags. Great buy/price. These liners are well packaged, very strong and perfect in size and appearance. We use them every day and we will continue using them from now on. I have been using this trash can & liners for over 5+ years now, yes, I highly recommend them to everyone. Why, i would always have to replace my trash can & the bags would leak not these ones, they fit perfectly and are clean, yet easy to use. No more spills too!! I like a trash bag that doesn't fall apart and will stand up to some abuse. The Simplehuman liners stand-up to the toughest of challenges. Better than even known national brands that promise flex and strength. It goes without saying that it fits the Simplehuman 38 liter butterfly step can perfectly. I buy them online in bulk to last the long haul and save some money in the process. These custom can liners are well made and reasonably thick. It's nice to have them precisely fit each can. However, they are too expensive and the only way to get a bulk discount is to buy a really large quantity. How 'bout making them available in lots of, say, 25 or 50 bags? this bag fits perfectly in my simplehuman trash can. it's also nice and strong. Love trash can and liners both! It is quality at a very reasonable price. I like all your products, and your customer service is among the best! These trash bags are amazing. As a family of four, we've been using the bags for the last two months. We won't go back to the Target version. Never a hole, never a tear. Perfect and reliable. These liners are a perfect fit and are quite strong. The Trash Can liners that really work. Using these liners resolved the normal issues of having the bag pop out of the trash can - fits like a glove. The best trash container I have ever had. The liners are easy to install and don't leak. The handle on the liners are perfect for carrying to the garbage can. I order these bags all the time. They are the best. They fit perfectly. Very please with this product. the bags fit the bin perfectly. Ordering online is easy and efficient. They fit my garbage cans perfectly. No more messy garbage cans! I was pleased with the quality of the liners. At first I thought they were expensive but as they say you get what you pay for. I am not fussing with the liner to stay in place it fits the can just right. Good bags for the butterfly opening trash bin. Fit well. A bit pricier than they need to be. These are the best trash bags ever!! I love them !!! i love simplehuman products down to the trash bags. I have never been as please as I am with this product! I'd ordered the Williams Sonoma exclusive stainless step can (retangular shape). I am pleased that the bags fit so well. By the way the trash can itself is wonderful. They are thick enough, fit very well and priced reasonably. Fits perfectly in the can and never leaks.